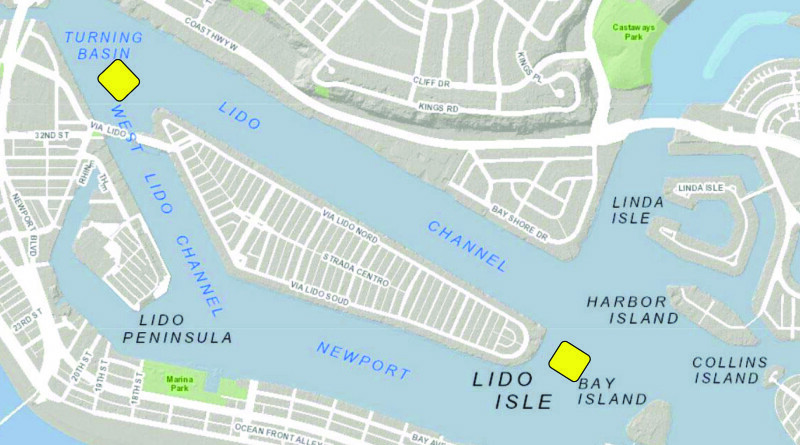 Visiting boaters can elect to stay in one of two public anchorages this summer with the recent approval of a second trial anchorage in Newport Harbor. Anchorage will run from Memorial Day to Labor Day at the Turning Basin. NEWPORT BEACH — A battle of who would have the right to enjoy the largest chunk of open water within Newport Harbor ended with boating interests coming out ahead last month, as the Newport Beach City Council voted on May 24 to establish a temporary anchorage at the Turning Basin. It is the second time Newport Beach is trying out the free public anchorage at the far end of the harbor. The 6-1 vote came at the behest of a few voices who viewed the establishment of a public anchorage – temporary or otherwise – at the Turning Basin as a challenge to the quality of life of waterfront residents. Last month’s decision came just ahead of the Memorial Day holiday. Both the city’s Harbor Commission and Harbor Resources Department hoped the second trial run of the temporary anchorage would be set up in time for Memorial Day and continue through Labor Day. Newport Beach Harbor Commissioners Paul Blank and Duncan McIntosh campaigned for the temporary anchorage at the May 24 council meeting. McIntosh said his colleagues and the city’s Harbor Resources Department learned many lessons from last year’s temporary anchorage. Those lessons were incorporated into the decision-making process to bring the temporary anchorage back for a second trial run. Blank also spoke to council members, telling them all the issues and concerns brought up by residents were addressed during several deliberations at commission meetings. With the council’s affirmative vote visiting boaters now have a public anchorage to visit at Newport Harbor’s Turning Basin. A permanent anchorage already exists on the east side of Lido Isle. Newport Beach tried its hand at a second anchorage at the Turning Basin last year. While the trial run did not yield many users there were a few takeaways the city’s policymakers incorporated into the new iteration of the anchorage. The Harbor Patrol would monitor the 10-week anchorage. Visiting boaters would be required to voluntarily comply with dye tablet testing protocols. Raft-ups –the tying up of two or more vessels – are prohibited and vessel generators must be shut off every day between 10 p.m.-7 a.m. There is also an overnight noise restriction between 10 a.m.-7 p.m.
Statistics to monitor noise complaints and nuisance violations will be compiled by Harbor Patrol. The number of vessels using the temporary anchorage – and each vessel’s homeport – will also be tracked. Adding a second public anchorage, city staff and harbor commissioners say, would complement the permanent venue currently operating on the east side of Lido Isle. Mayor Diane Dixon said she voted against the trial anchorage because residents in her district, which includes the Turning Basin, believed the boating venue would adversely affect quality of life. Some residents have previously complained of harbor views being blocked by boats in the anchorage. Others complained of loud music and partying emanated from the anchorage area. The mayor acknowledged, however, she is hopeful the second running of the temporary anchorage would yield positive results. Pamela Whitesides has been a regular critic of the temporary anchorage at the Turning Basin. In an email to City Council members Whitesides said Newport Beach steadily enacts policies favoring visitors and businesses over residents. The initial temporary anchorage trial run operated last year from late summer to early fall. On your overnight noise restriction pointed out above, I think you intended 10 PM to 7 AM. Additionally, I am interested to see the follow up report on how many local Newport Harbor boats use this anchorage vs “the visitors” that Ms. Whitesides uses for her argument against the secondary anchorage. As a local tax paying resident and boat owner I enjoy that part of the harbor.